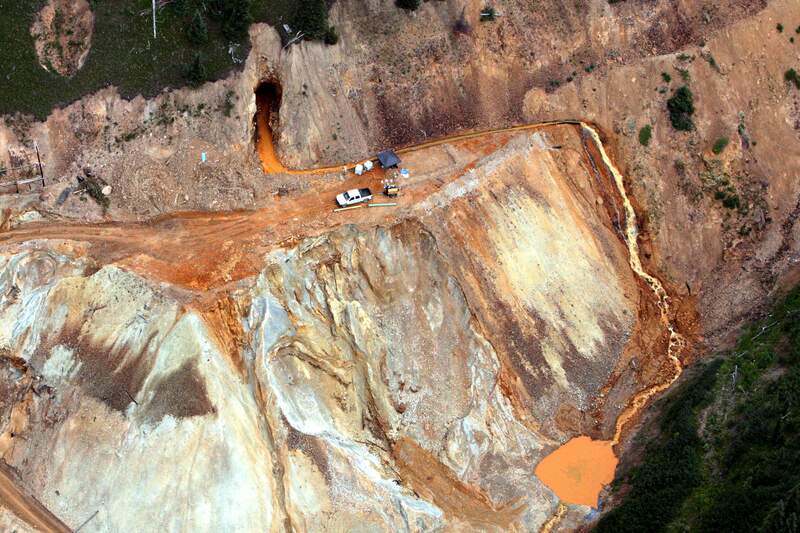 In this aerial photo taken Tuesday, Aug. 11, 2015, waste water streams out of the Gold King Mine near Silverton. The Hardrock Mining and Reclamation Act of 2017 was introduced on Tuesday in an effort to reform 19th-century hard-rock mining laws. 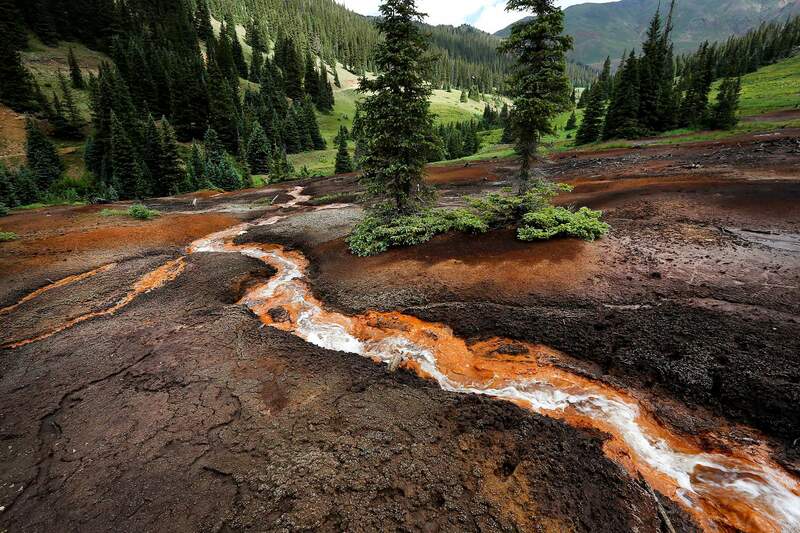 Water flowing from the Red and Bonita mine north of Silverton contains magnesium, zinc, copper, lead, and iron, kills just about every thing in its path. The Hardrock Mining and Reclamation Act of 2017 was introduced on Tuesday in an effort to reform 19th-century hard-rock mining laws. 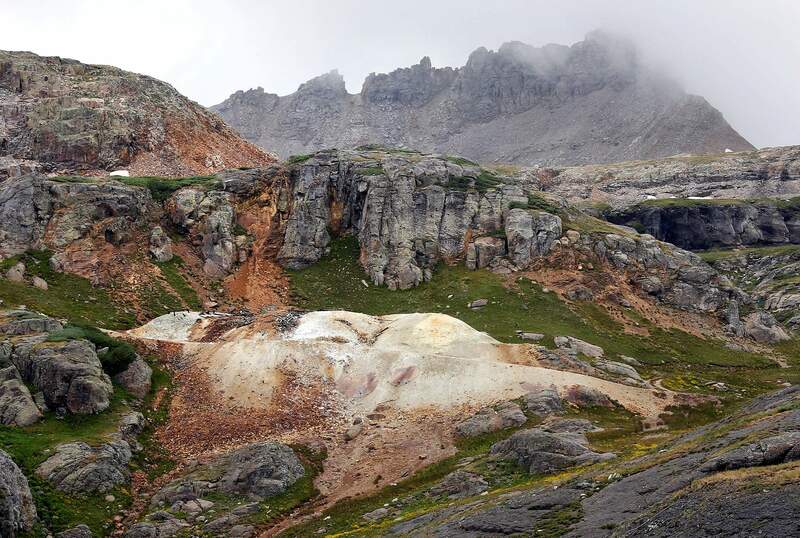 The Bullion Mine at 12,400 feet, northwest of Red Mountain, is in line to have the pile of waste relocated and buried away from any water flow. The Hardrock Mining and Reclamation Act of 2017 was introduced on Tuesday in an effort to reform 19th-century hard-rock mining laws. 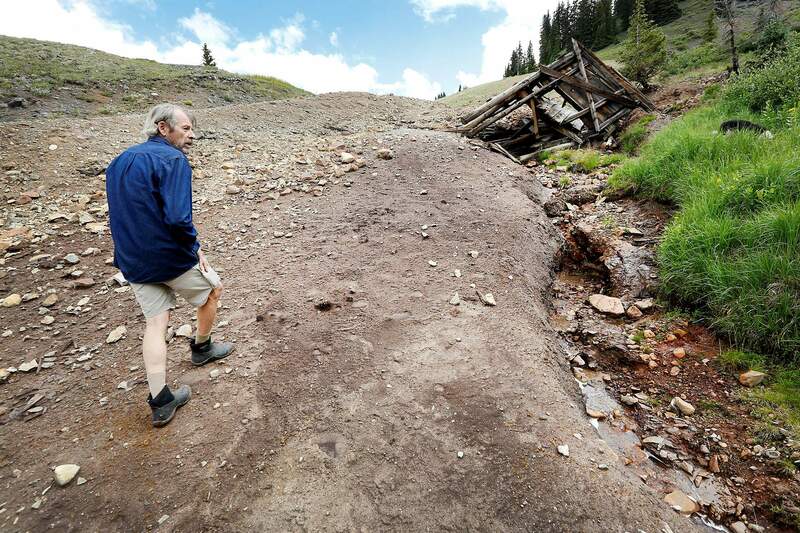 Bill Simon, a co-coordinator of the Animas River Stakeholders Group, looks over a small pile of mining waste below the San Antonio Mine with the Congress Mine behind him near Red Mountain Pass. The Hardrock Mining and Reclamation Act of 2017 was introduced on Tuesday in an effort to reform 19th-century hard-rock mining laws. Old mining equipment litter the mountainside of the Red and Bonita Mine. The Hardrock Mining and Reclamation Act of 2017 was introduced on Tuesday in an effort to reform 19th-century hard-rock mining laws. Colorado Sen. Michael Bennet, along with Sens. Tom Udall, D-N.M., Martin Heinrich, D-N.M., Ron Wyden, D-Ore., and Edward Markey, D-Mass., introduced the Hardrock Mining and Reclamation Act of 2017 on Tuesday to update the nation’s antiquated hard-rock mining laws. The bill would reform the General Mining Law of 1872 that allows companies to extract minerals such as gold and silver on federal public lands without paying royalties, and while avoiding liability for any environmental damage. 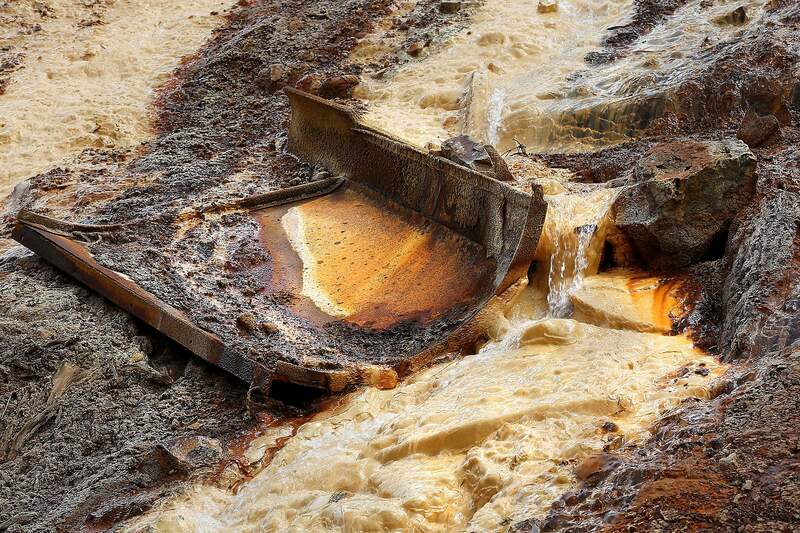 The proposed legislation would help pay for abandoned mine cleanup and prevent future disasters. Bennet referenced the 2015 Gold King Mine spill that sent an estimated 3 million gallons of heavy-metals laced mine wastewater into the Animas and San Juan rivers in a news release on Tuesday. Require hard-rock mining companies to pay an annual rental payment for claimed public land, similar to other users.Set a royalty rate for new operations of 2 to 5 percent based on the gross income of new production on federal land.Create a Hardrock Minerals Reclamation Fund for abandoned mine cleanup through an abandoned mine reclamation fee of 0.6 percent to 2 percent.Give the secretary of the Interior the authority to grant royalty relief to mining operations based on economic factors.Require an exploration permit and mining operations permit for noncasual mining operations on federal land.Permit states, political subdivisions and Indian tribes to petition the secretary of the Interior to have lands withdrawn from mining.Require an expedited review of areas that may be inappropriate for mining.The bill is supported by leaders throughout Southwest Colorado, including La Plata County Commissioner Julie Westendorff, Durango City Councilor Dean Brookie, San Juan County Commissioner Pete McKay and Trout Unlimited’s Ty Churchwell. “As a general concept, we do support the idea of addressing the mining act, specifically creating a dedicated funding force for mine cleanup,” Churchwell said. Churchwell said creating a royalty system would fall in line with other extractive industries, such as oil and gas.